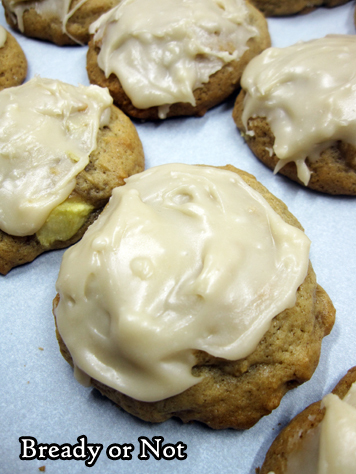 These Caramel Apple Cookies involve some extra work, but they are worth it. These are among the best cookies I have ever made. That’s saying something. They also might involve some blood-letting. Let’s just say I will never again try to grate apple. I’m fine with finely dicing with a knife from now on. But hey, as history and mythology has taught us, sometimes blood-letting comes to good purpose. 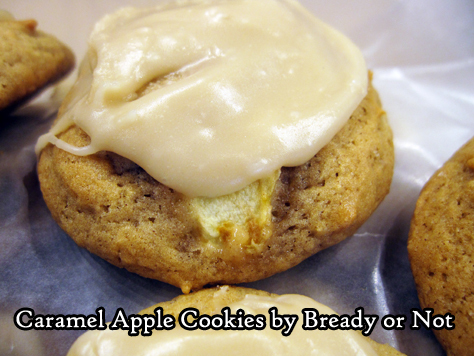 These are chewy, sweet, soft apple cookies topped with caramel. If that’s not worth sacrifice, what is? Use some variety of sweet-tart apple like you’d use for a pie. I used Braeburn, but Granny Smith and Jonathan are also good choices. 1 cup grated/diced is most of a medium apple. These cookies reminded me of a fresh-made and frosted version of the Little Debbie’s Apple Delights that I loved loved loved as a kid. I have never before had a homemade cookie that was like this. You may have some frosting leftover at the end; I had about 1/3 cup. Just look for random things you can frost like Golden Oreos, the cat, graham crackers, human flesh, etc. 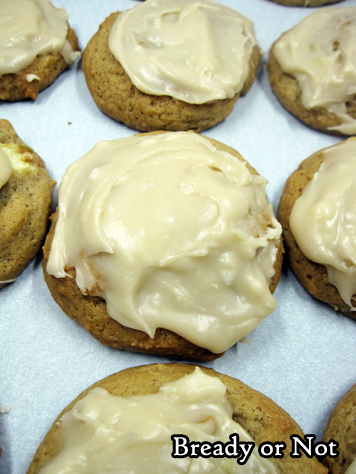 Trust me, you don’t want this apple-caramel frosting to go to waste. These stunning Caramel Apple Cookies involve a little extra work, but their deliciousness is well worth the effort. Use a tart or sweet-tart apple like Braeburn, Granny Smith, or Jonathan. Recipe makes about 36 cookies using a tablespoon scoop. Preheat oven at 350-degrees. Line cookie sheet with parchment paper. In a large bowl, beat butter until smooth, then add brown sugar, baking soda, cinnamon, cloves, and nutmeg, and salt. Continue to beat until fluffy, scraping bowl as needed. Beat in the egg and apple cider or juice. Slowly mix in flour. Fold in the apple bits last; dough will be very soft. 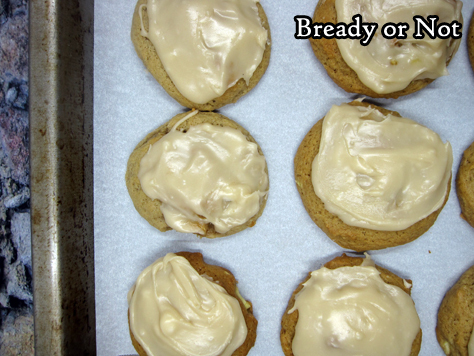 Use a tablespoon scoop to space out dollops of dough on the parchment paper. Bake about 12 to 14 minutes, until golden brown; be careful not to under-bake, as the cookies need to be sturdy enough to be frosted. Completely cool cookies on wire rack. 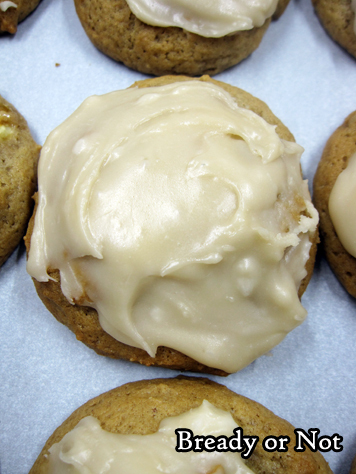 When the cookies are cool, begin making frosting on stovetop. On medium heat in small saucepan, stir together brown sugar, butter, and apple cider or juice. Heat until the brown sugar is dissolved. Gradually stir in the confectioners' sugar. Begin frosting cookies immediately; the back of a spoon works well. If the frosting in the pan begins to harden, stir in a few drops of hot water until it is smooth again. 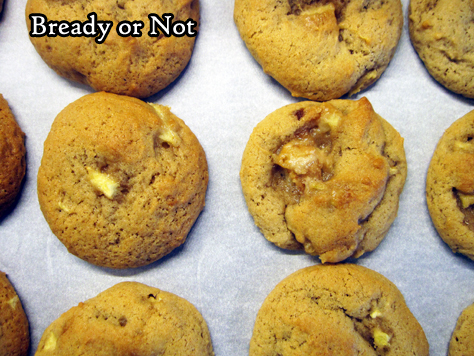 Store cookies in a sealed container at room temperature with wax paper between the layers.